When 2011 came, Cynci asked Dawn if she’d be willing to help about 100 of the neediest kids living and working in the rock quarries of India. The original plan was to build a one-room schoolhouse to start an education program. As a secondary education-trained teacher, Dawn was on board immediately. “The kids and their families eked out a living by digging out granite rocks, and children even as young as five would use dynamite to blow up the rock to get it out.” They made barely $1 a day,” reported Cynci Petersen of the Hope Venture. 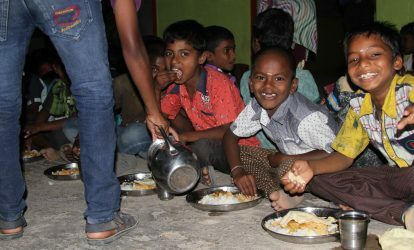 Cynci and Dawn were both excited about the project; however, when Cynci’s contacts on the ground in India reported the desperate situation these children were in, it became immediately evident that the urgent need was for food. These children were literally starving, and the modest school building would have to wait. Cynci shifted gears and wanted to launch a feeding program; but Dawn wasn’t too enthusiastic about this. She was thinking long-term and asking herself, “How can we sustain this? Once our project money is done, what will happen to the feeding program?” Since Dawn prefers to choose projects where she can see it from beginning to end, it took a step of faith when Dawn funded the start of the feeding program. Would anyone join them in this effort? The money from NATS and others was able to start the first feeding center in what they call the “blue building.” Since then, two more are up and running. This project is continuous and provides one meal a day to children in the surrounding area. When their team first came into the community a Hindu village leader was not enthusiastic or at ease about the Americans being there. He thought they were trying to “steal” something from him. Cynci and her team assured him that they would not get in his way and that they only wanted to give a little bit of food to the kids. Several months later, Cynci revisited that area. She was shocked to find a building, much like the one they originally intended construct, with the words “The Hope Venture” painted on the outside. It turned out that when the Hindu leader saw foreigners caring enough about their children to feed them, he approached surrounding families in the area and challenged them, saying, “These foreigners care more about our own children than we do!” The Hindu leader loved what The Hope Venture was doing, and it was he who spearheaded the efforts to build the school building that Dawn and Cynci had originally wanted to finance. “It is a testimony to (our) partners being faithful and bringing Jesus to the community,” Cynci remarks. Every time Cynci visits the area, the Hindu leader greets her enthusiastically and is glad to see them.The dream that Dawn and Cynci had to build a school was fulfilled. Cynci continues to wonder what they are doing and if they will be able to keep sustaining the center. However, it has become a hub of community life. Children are being fed, some are taught computer skills and more importantly, this blue building has become a safe place for individuals to come and receive support. Cynci did not imagine the project to continue for as long as it has, but she firmly believes that their welcoming doors will stay wide open for as long as God provides. Want to know when 2018 applications open, along with any other updates or stories?